Royal Rumpus is a Duel minigame in Mario Party 7. Its title is a play on the term "royal ruckus". 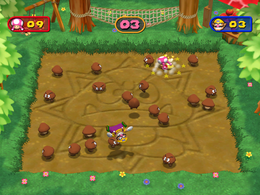 The object of the game is to Ground Pound as many Goombas as possible within the time limit. Pressing only once, makes the player just stomp on the Goomba, earning them no points. There are also Gold Goombas that are worth three points and run faster than the regular Goombas. The player with the most points wins. Rules – "Ground Pound the Goombas to earn points! The player with the most points wins!" Advice – "Gold Goombas are worth 3 points each. They move quickly, but are well worth the effort." This page was last edited on November 13, 2017, at 11:31.